There are many different First Nations in Canada. First Nations, sometimes also known as aboriginals or natives, are the descendants of migrant hunters believed to have crossed an ice bridge from Asia to Alaska between 70,000 to 40,000 years ago. Different nations or families of First Nations can be found throughout Canada. 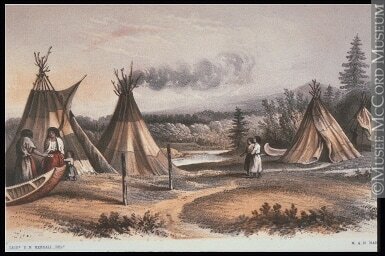 Each of the three groups of First Nations occupied (lived) on different areas of the land. Where these groups lived affected how these people lived. In order to survive in these different environments each group had to adapt. The Iroquois lived in areas known as the Great Lakes Basin and the St. Lawrence Valley. Both of these areas had very good land to grow crops so the Iroquois were mainly farmers. The Algonquian lived in rocky regions so they relied on hunting and gathering to survive. 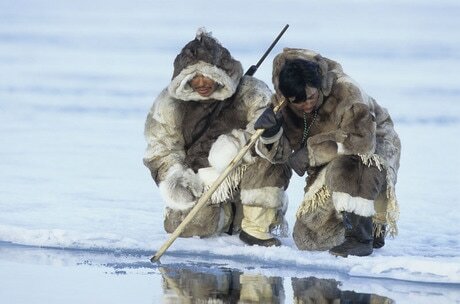 The Inuit lived close the water in the North where it is very cold. Therefore they survived by hunting and fishing. 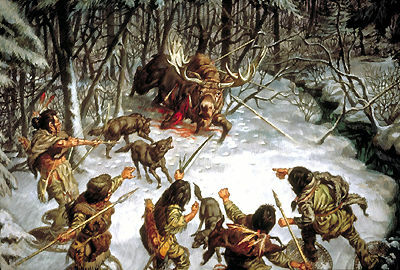 The Algonquian way of life relied mostly on hunting animals such as caribou, moose, and deer as their main source of food. To be successful hunters they needed to follow the herds throughout their territory. Because they moved around so much they are known as semi-nomadic (nomadism is when you always move around; semi-nomadism means that they returned to the same place every summer). Family relationships were patriarchal. This means that that men led their families and dominated their political system. Men were responsible for the hunting and building. Women were responsible for collecting vegetables, making tools, and clothing. In the summer months the Algonquian lived in a type of house known as a wigwam. These are also sometimes knows as a teepee. Families were the most important social unit and were made up of grandparents, their children, and the children of their sons. Algonquians did not have a strict political structure at all times. When Chiefs, or leaders, were occasionally appointed it was for a very specific reason. For example, they were responsible for leading an attack against enemies, negotiating an alliance with other groups, or organizing some expedition (hunting or exploring). 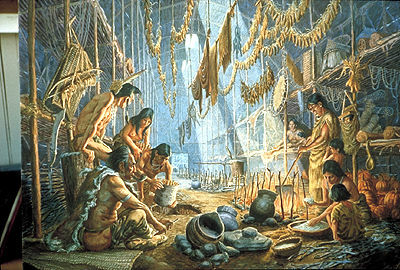 The Iroquois people relied mainly on early agricultural techniques as their main source of food. This meant that the generally stayed in the same location for a number of years. People stay in the same place are known as sedentary people (the opposite of nomadic). Staying in the same place allowed the Iroquois to build houses that were much more stable and long lasting than the Algonquian. The Iroquois lived in wooden longhouses. Women played an important role in Iroquois society. They provided the main source of food from farming and the women were the head of family. This is known as a matriarchal society. 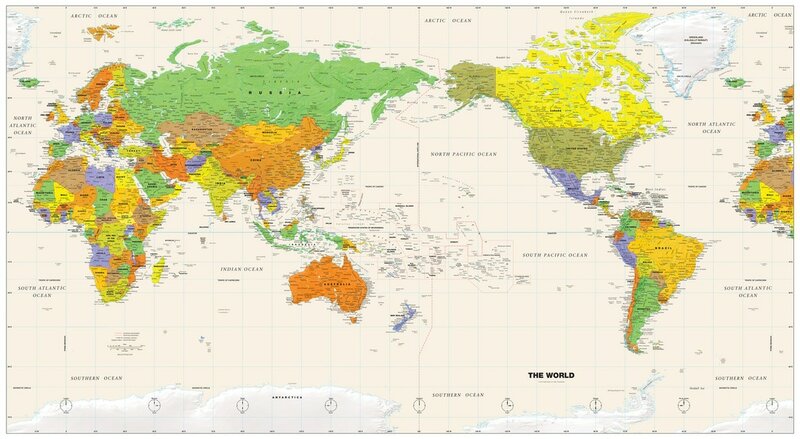 The Inuit lived in the North where the winters are very long and the temperatures are colder than in the south. 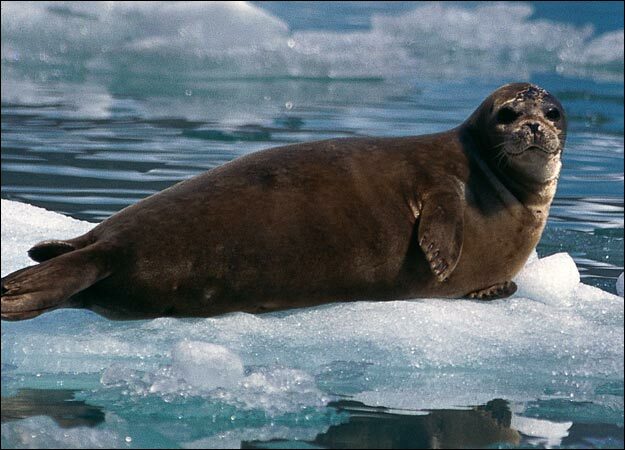 Growing food was impossible due to the cold climate so they lived by hunting caribou and marine mammals (mammals that live in the sea, such as seals). Inuit had to move to find animals to hunt so they led a nomadic way of life. In the warmer summer months, they lived in tents. In the winter they lived in insulated homes that were partially buried in the ground to keep them warm. During hunting trips in the winter they would live in igloos. Like the Algonquian, Inuit society was patriarchal. This was because of the importance of hunting, which was a male task (job). Temporary Chiefs were selected to lead hunting trips.